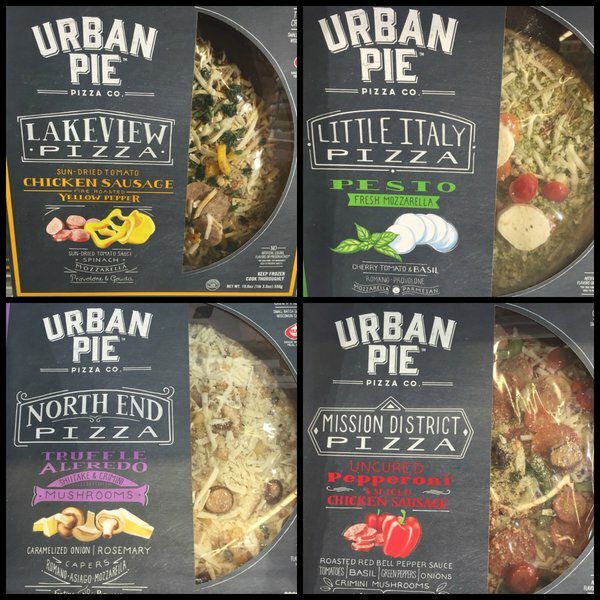 packaged FINDINGS: Urban Pie™Pizza Co. stands out on shelf – but can it go further? This week’s packaged FINDINGS: Urban Pie™Pizza Co. stands out on shelf – but can it go further? Admittedly, I am a total pizza snob. For the most part, I only eat pizza freshly made from a parlor. 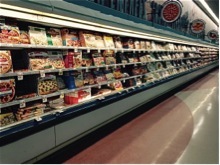 I rarely cruise down the pizza aisle at the grocery store. It just seems to be a massive space of frozen food screaming the same thing over and over again. Nevertheless, I clearly understand that frozen pizza, as a category, is principally a convenience food. 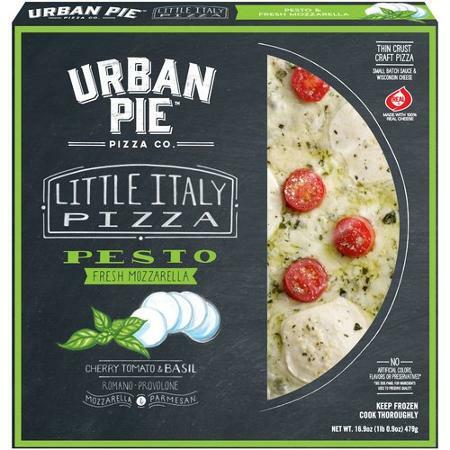 While not shopping with the intent of purchasing frozen pizza, I was literally stopped in my tracks by the Urban Pie Pizza Co. product line as I passed an end aisle cooler. The packaging made me think of a restaurant menu board with the flavor of the day or featured specials, not frozen prepackaged pizza. Although the box was conventional, instead of relying on a photograph of baked pizza and a super size logo, this package used a large semi-circular die cut exposing distinctive ingredients like fresh mozzarella, whole cherry tomatoes, and truffles. Four flavor varieties noted by accent colors and stylized ingredient illustrations helped grab my attention and keep me focused on the message. However, as effective as this package was at initially catching my attention, I think it could have gone further. Black is a power color and used frequently in pizza packaging, but in this case I could not tell if the package was black or grey. Pushing this to either a solid color or an image that perhaps looks more like a menu board background would have made a difference. If the idea was to simulate a menu board, the typography could have been made to appear as hand written in keeping with the “crafted” pizza concept. The die cut opening displaying the pizza was helpful in communicating content, however the pizza being loose in the box meant that shifting might expose a part of the pizza with no toppings. I experienced this on the way home. Perhaps a change in the size of the die cut should be considered. While I believe the intent was to minimize clutter on the face panel, important messaging about no artificial colors, flavors or preservatives, and use of “real” Wisconsin cheese became so secondary they got lost. It took too long to discover that the pizza featured small batch sauce or a thin crust style. And by the way, what is small batch sauce? Is this a proprietary process or flavor? If it isn’t important, why is it on the face panel? On the back panel there is additional feature copy and “how to use” instructions, which are simple and direct. In this case because of the carton size, there is a large amount of space available. I recommend using this space to reinforce brand communication and repeat the format and components fro m the face panel. I also feel there is a missed opportunity to add more about the taste varieties – what distinguishes Little Italy from North End, Lakeview and Mission District and why? It might help inspire consumers to try other flavors in the product line. The package is successful because it delivers on shelf, creating a high impact brand wall in a category that has a lot of chatter. With a little tweaking, Urban Pie Pizza Co. can continue to have maximum shelf impact and go a lot further toward completing their story. Now I have to turn the oven on and see if the taste lives up to the idea. If you are thinking of creating a new package or adding new products to your mix, our packaging experts can help you tell your story and connect with your customers. Contact us at 920-725-4848 or info@brand-directions.com.